During the work week, Christy and I really enjoy taking tasty sandwiches as part of our lunches. You really can’t beat black forest ham and swiss with cracked pepper and some red onion on fresh bread. Equally as good is roast beef with provolone or turkey breast with asiago. During a busy day, a hearty sandwich really keeps me going. Be sure to heat the milk and molasses on low heat so you don’t curdle the milk. That would be nasty in your bread. During a recent visit to the grocery story, I was appalled to see that almost all of the bread for sale contains High Fructose Corn Syrup, HFCS. This stuff is found in almost every processed food Americans eat these days and it really scares me. It’s a chemistry experiment, not an ingredient for food (my opinion, of course). Even so, HFCS is in ketchup, soda, cereal, some deli meats, most of your snack bars, and a myriad of other products. The revelation that HFCS was in even many of the “healthy” multigrain breads caused me to post a rant to Facebook which was answered by our good friend Paralee with a recipe for multigrain bread. She got the recipe from here, and I have slightly modified it into the recipe you see below. I added rosemary and rewrote the direction to coordinate with my photos and to explain some of the techniques. 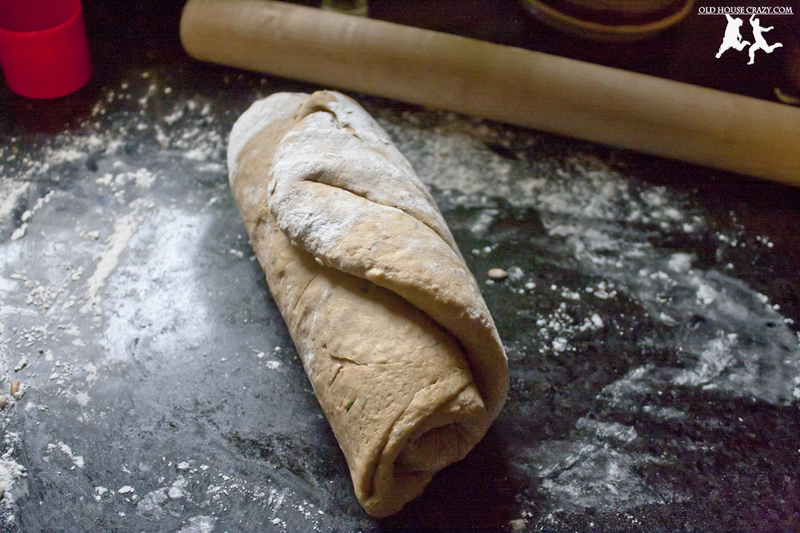 If you just want to bake the bread, print the recipe from the link and add in a bunch of rosemary. Get an infrared thermometer. They measure the temperature of stuff without touching it. Neato. 1. 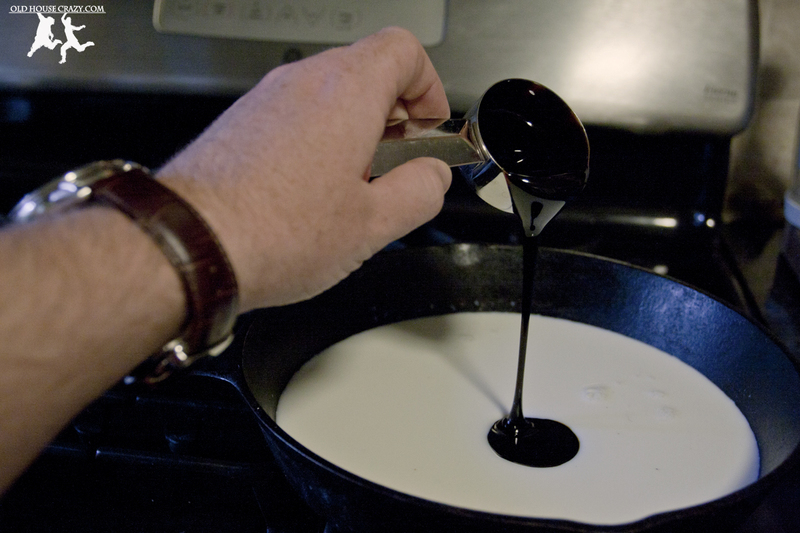 In a small saucepan over low heat, combine the milk and molasses. I prefer cast iron for its slow and even heating properties. 2. Heat to 105-110 degrees Fahrenheit. 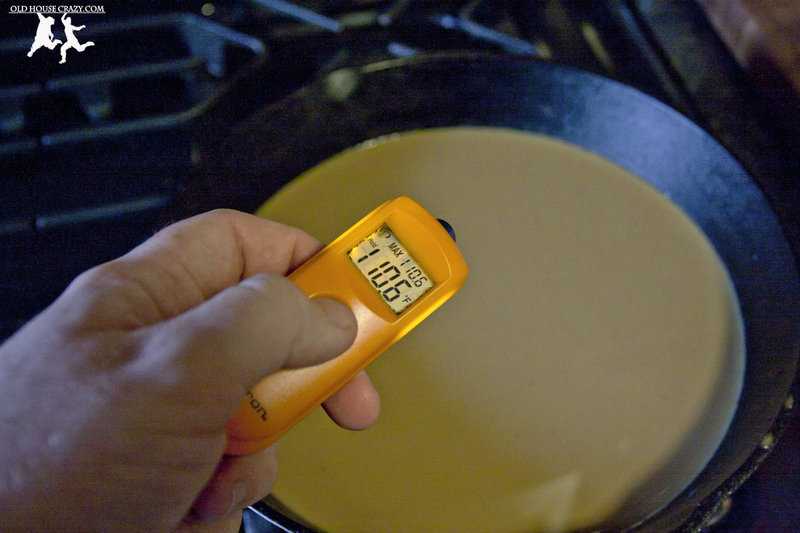 I use my infrared thermometer to measure the temperature of heating liquids. I don’t have to dip it into the liquids so I don’t have to clean it. Win. 3. Remove from heat and sprinkle yeast on top; allow to stand until foamy, about 10 minutes. Every time I’ve made this bread, it’s taken a good 20 minutes to get to where I called it foamy like the photo above. 4. 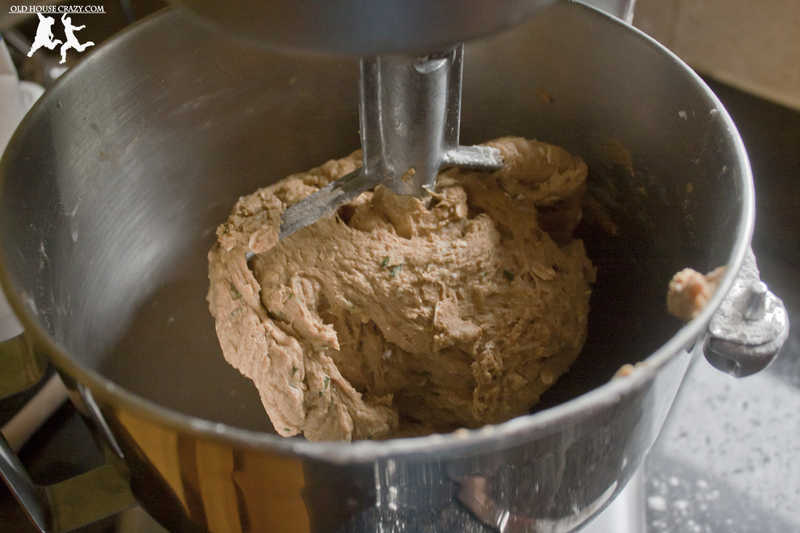 Fit the mixer with the paddle and stir together the 2 cups all-purpose flour, whole-wheat flour, 1/2 cup rolled oats, all of your chopped rosemary, and 1 1/2 teaspoons Kosher salt. 5. Whisk the egg yolk into the yeast mixture and add to the bowl. When separating yolks from whites, use your fingers. 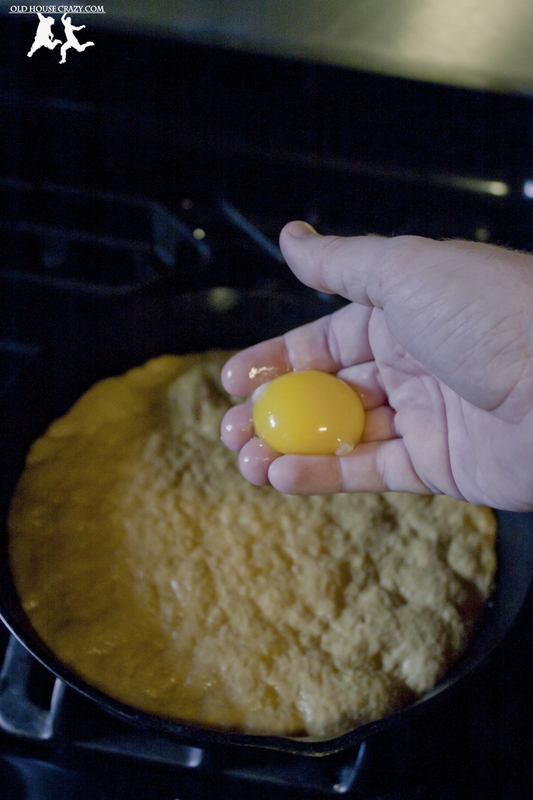 Just crack the egg into a bowl and grab the yolk with your fingers. It’ll pop right out of the white if you do it right. You can also crack the egg and pour it directly from the shell into your hands. Let the white run through your fingers into the bowl. If this grosses you out, you’re not having enough fun with your cooking. 6. Beat on medium speed until a sticky dough forms. You’ll see it stick to the paddle as it circulates, forming little dough “arms” that look like they’re reaching for the paddle from the side of the bowl. 7. Continue to beat, adding small amounts of all-purpose flour until the dough comes together into a smooth ball, as seen in the photo above. I used another 1-1.5 extra cups. It seems to be a lot more than just a small amount. Keep adding until it looks and feels right. 8. Fit the mixer with the dough hook and knead on medium speed until smooth and elastic, 6 to 8 minutes; add additional all-purpose flour as needed to reduce stickiness, but not too much or it will get tough. 9. Form the dough into a ball and place in a lightly oiled bowl turning to coat with oil. 10. Cover the bowl with towel and allow to rise in a warm place until doubled, about 1 hour. It might take as much as 1.5 to 2 hours, depending on the conditions inside your kitchen. Yeast likes warmer conditions, so don’t sit the bowl under a fan or air conditioning vent. 11. 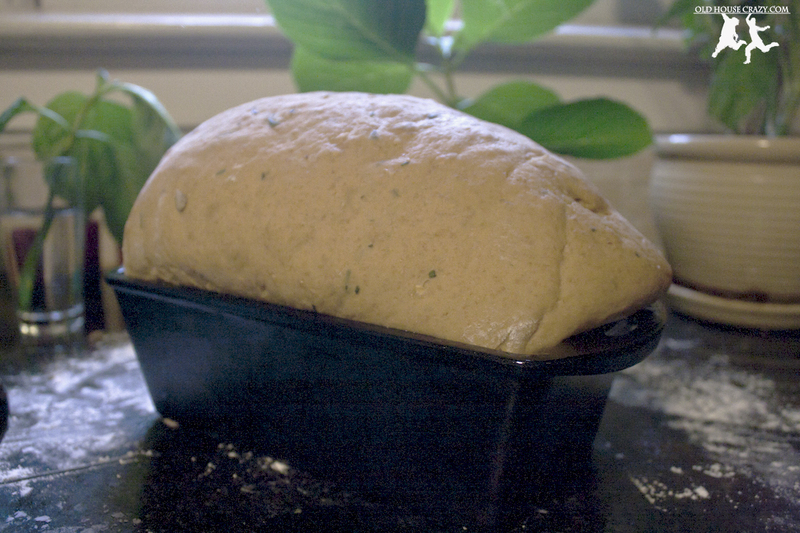 Lightly oil a 9 x 5 inch loaf pan. I much prefer cast iron because it heats evenly and gives the bread a perfect crust all the way around. 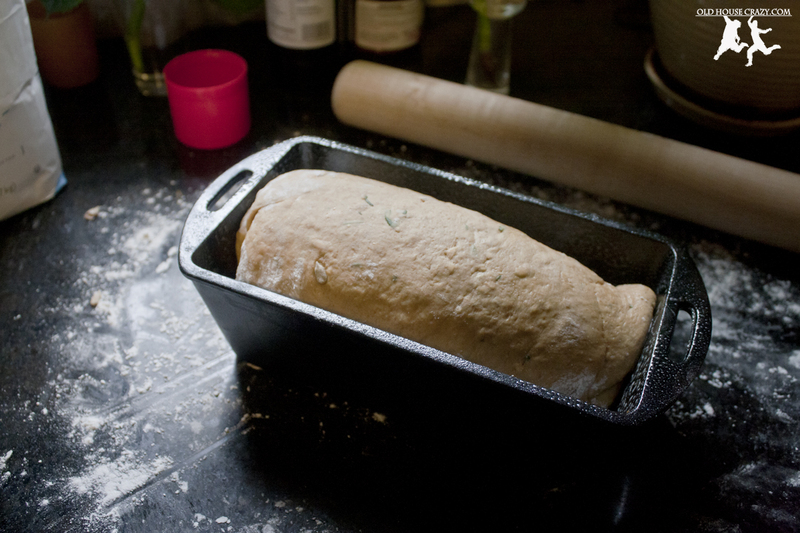 Properly seasoned cast iron also releases the bread perfectly every time, without sticking. I also just like the weight. 12. Punch the dough down and let rest for 10 minutes. 13. Turn dough onto a lightly floured work area and sprinkle with 1/3 cup sunflower seeds. 14. Knead the dough until the seeds are evenly distributed. Or don’t. Omit the seeds if you don’t like them. I bet it would also be very good with walnuts or almond slivers and maybe even raisins. I should have reshaped the loaf so both ends were the same size. The loaf came out with one end bigger than the other. 15. 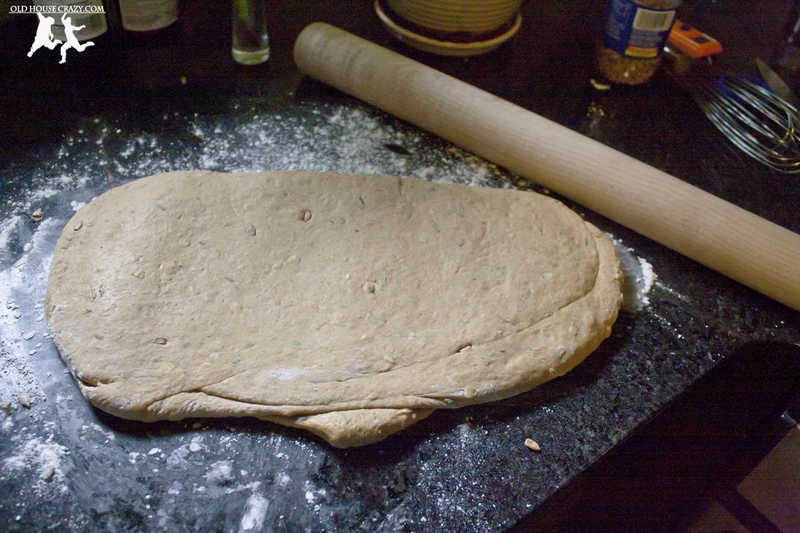 Roll the dough into a 12 by 7 inch rectangle and beginning on the short side, roll up loosely and pinch the seam to seal. 16. Place seam side down in prepared pan, cover and allow to rise until doubled, approximately 30 minutes. 17. While the dough is rising, preheat oven to 350 degrees Fahrenheit. 18. In a small bowl, lightly beat the egg white with 2 tablespoons of olive oil. I also added some crushed rosemary. 19. 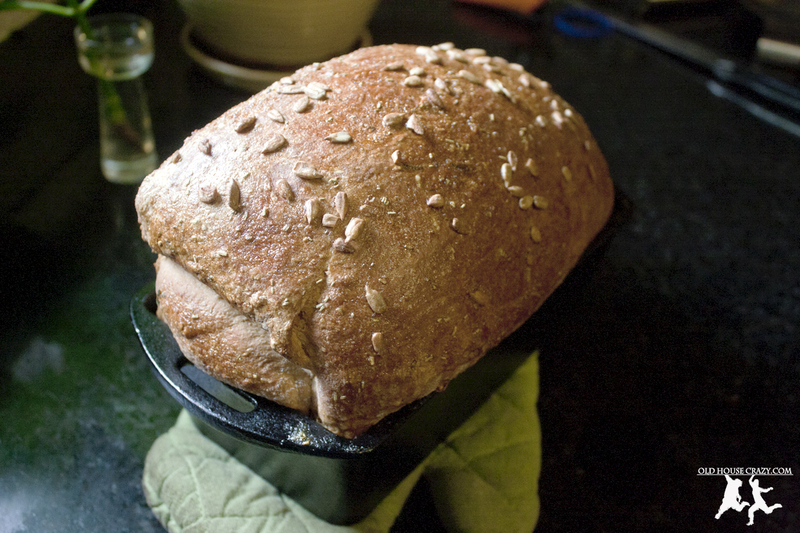 Brush the top of the loaf with egg mixture and sprinkle with remaining tablespoon of rolled oats and sunflower seeds. 20. Bake until the top is golden and hollow sounding when tapped, about 40 minutes. 21. Cool in pan for 5 minutes then turn out onto a wire cooling rack and cool completely before slicing. If you don’t have some sort of bread slicer, just use a steady hand and practice getting those slices even. It’s much more difficult than you’d think to cut a whole load to the same size. This entry was posted in Better than store bought, Bread, Garden, Healthy Eating, Home made, Recipes and tagged better than store bought, bread, cooking, Herbs, home made, Make it yourself, recipes. Bookmark the permalink. I will try this bread. It looks yummy. Why do you not use the dough hook the whole time? I use the paddle to get everything mixed, then the hook to knead. The hook isn’t very good at evenly mixing the dry and wet ingredients.